Composed in the four-to-six minute interval of photographic exposure, Hadi Fallapisheh’s photograms are an amalgam of processes, fictions, and stratified opposites. 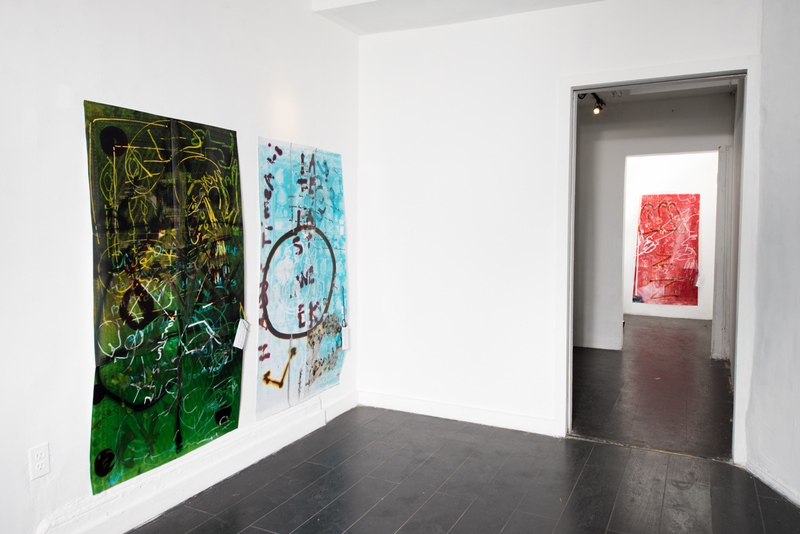 A first look at the scribbled imagery evokes the graphic lineage of Twombly and Basquiat, yet under scrutiny the caricatures and handwritten text serve as a means to collapsing the image into the abstracted imprint of a performative act. Every aspect of each composition is traceable to a vertiginous upset of power structures, as each process-based element of the photogram reveals or implicates an underlying defiance of the cultural traditions from which its signifiers are comprised. While Fallahpisheh, who recently received his MFA in photography from Bard, admits to studying the cameraless photography of Lazlo Moholy-Nagy, he cites American west coast contemporary photographers in the vein of James Weiling, Eileen Quinlan, and Walead Beshty among his influences, and finds special resonance with the work of Amy Sillman. Each work is comprised of six sheets of archival photo paper, which the artist meticulously but blindly tapes together in the darkroom. The support is laid on the floor, below a light source (enlarger) that projects an image of a prayer rug onto the paper; the assembled photographic paper is itself approximately the size of a prayer rug, and the pictures of each rug are assembled from images sourced online. Prior to entering the darkroom, Fallahpisheh memorizes a joke that is common to the culture of his native Iran, and once the overhead light is activated, he begins rendering the hand-drawn and written elements of the composition using Sharpie, crayon, and a flashlight. During the interval of exposure, Fallahpisheh translates the joke into English and writes it on the paper, among his other scribbles, which always include a cartoonish rendering of a protagonist he calls “Hadji.” Taping the paper together takes about thirty minutes, so the inscription of the joke is an exercise in both translation and memory. Wearing a beard, turban, and robes, Hadji is the subject of each joke, which consistently fails to retain its humor when translated into English: “One day people asked Hadji when his birthday is? Hadji said ‘April 26th.’ People asked: ‘Which year?’ Hadji thought for a couple of minutes and said: ‘Every year.’ Then people laughed.” In a conversation with the artist, the importance of the Hadji character was a recurring point of emphasis. “Hadji” is a term common to Farsi, Arabic, and Turkish and is used to indicate a Muslim who has completed a pilgrimage to Mecca (the Hajj). After the photograms are finished, Fallahpisheh copies the joke as he translated it in the darkroom onto typeset note cards, which are then attached to the photogram with a string of prayer beads. The titles for each work are derived from the jokes, and any grammatical errors committed in the inscription on the photogram are retained in the typeset card, emphasizing the entropic nature of cultural and linguistic translation. The importance of interstitial spaces was another recurring theme of our conversation, and I was surprised to learn that Fallahpisheh was not familiar with the English phrase “gray area,” as the photograms are littered with strokes of chalky gray, which indicate that the mark was made toward the end of the exposure period, when Fallahpisheh was running out of time. That is, they index the interim between performance and permanence. The marks also represent, as the artist explained to me, a temporal collapse: in photography, a gray card is used as the primary point of tonal reference, i.e., the empty, neutral ground from which the exposure process begins. In Fallahpisheh’s photograms, this gray represents the end of the process, converging beginning, middle, and end of the compositional process into a singular, holistic image. 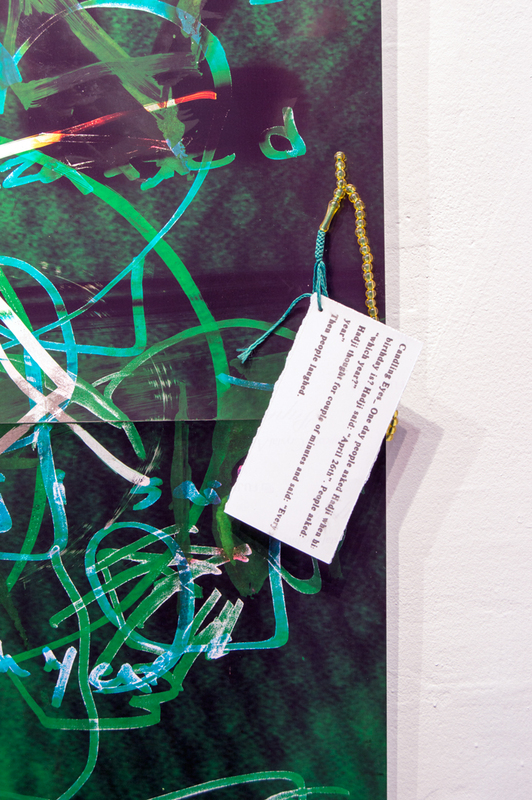 This graying process establishes a conceptual foil to the stratification of opposites that comprise the formal and chromatic elements of each work, for the colors of the prayer mats are inverted in the final photogram: magentas become greens, yellows become blues, and the black of the permanent marker turns to a sharp white. Likewise, Fallahpisheh comes to his practice with geographically opposed backgrounds; while he has always cultivated an interest in the Western tradition of abstraction in photography, he injects a narrative process into each work. However, each work presents an intensely layered composition, ultimately using figuration as a means to arriving at a state of densely signified abstraction. This coalescence of seemingly antipathetic implications runs deeper when one examines the archival aspect required for this approach to image-making; in their composition, the photograms become a platform for the collapse of memory, not just the artist’s, but a collective cultural memory as well. The jokes are well-known throughout Iran, and Fallahpisheh grew up around film photography and darkrooms, as his mother was a photographer. Yet, as the artist emphasized, the works are decidedly Western in their approach; the satiristic components would not read in an Eastern setting, and the formal components of the work are heavily informed by an understanding of American and European 20th century art history. As far as recognizable imagery is concerned, Fallahpisheh’s Hadji character is layered among and conflated with the text of the jokes, the designs of the prayer rugs, and a variety of props that may be read as teakettles, bongs, or phalluses depending on the viewer’s proximity, vantage, and mindset. Indeed, Fallahpisheh seeks to create work that is open to projection from the viewer; in fact, he finds work with definitive heuristic value to be propagandistic. To add another aspect of participation, viewers are allowed to touch the prayer beads. This emphasis on touch is intentional, and likewise thoroughly ingrained in the works themselves. The presence of either the signified or indexed hand (or in one work, both) is ubiquitous throughout the series, and the performative compositional process involves a high level of tactility, as the artist moves over and about the paper while on his knees (similar to the pose taken in prayer). In once instance, a bright pink miasma of color has been burned onto the paper, forming a silhouette around a white hand, evoking the imagery of cave paintings. The mark was made by a flashlight, which was held over the artist’s hand as it pressed against the paper. This theme also ties the formal aspects of the content to the three-dimensionality of the prayer beads—accessories ubiquitous in Iran that, according to Fallahpisheh, don’t necessarily indicate religious devotion—which are themselves meant to be ruminatively handled. Indeed, photograms, as a medium, necessarily implicate tactility, as they are typically created through the placement of objects on the light-sensitive paper and then exposing it. However, in Fallahpisheh’s work, the objects are Hadji, the jokes, the prayer rugs, and the artist himself. The performance aspect of the composition lies at the crux of the series; Fallahpisheh, who is not religious, found the act of prayer highly performative when living in Iran, where daily prayer is required in school. By accident, the time it takes for the paper to become fully exposed is about the same amount of time of each Salah. This empty religious action is mirrored by the compositional processes required to create the photograms, yet this time Fallahpisheh is in the dark, working blindly with only his sense of touch to guide him. Dogmatic ideology is replaced with artistic intent, touch replaces sight, and prayer is replaced with humor. To be sure, these systemic upheavals extend beyond the confines of the darkroom; Fallahpisheh confessed that he was banned from four different photography laboratoires while he was creating the series, as the crayon and marker damaged the machines used for developing papers. He was struck by the power held by flimsy sheets of paper that, through a chaotic, organic process, was rendered capable of breaking down the printing machines of multiple image-making centers. Fallahpisheh noticed further resonances with this structural inversion: jokes, when they are successful, function as a sudden, unexpected surrender of perspective to the joke-teller. Graffiti is likewise an unauthorized, guerilla assertion of pictorial or text-based projection onto a (usually institutional) surface or facade. Even the haptic imprints carry implications of panoptic structures, Fallahpisheh points out, as they exist in a middle ground between signature and fingerprint, i.e. legal versus criminal associations. Further, both joke-telling and graffiti are necessarily public practices, yet in these works they are executed while the author is alone, and in the dark. The Hadji character manifests a criticism of masculine homogeneity endemic to many Eastern cultures, which Fallahpisheh finds aberrant. The fragility of this gender-based homogeneity is revealed through the artist’s creative process, as the works manifest a conceptual openness by providing a structure that jibes with the heuristic projection of the viewer. The doctrines from which the figure emerges is removed through a process that mirrors the tenets of its culture, and its power is usurped by his transmutation into a delicate object—part of which the public is invited to touch. Fallahpisheh sees many parallels between joke-making and photography: both are multifunctional and turn about a presupposition of reportage, except their truths are often revealed by portraying events through a skewed, exaggerated, or purely fictional narrative. Both only function as the author intended when situated in their original context; remove them from their cultural associations and often their power loses its potency. The theme of repetition holds a similar duality for the artist, as all photographic practices are inherently repetitive (notably, comics adhere to a similarly repetitive process to advance their craft). This theme is transmuted into an animative—or perhaps more accurately, re-animative—process that shadows the entire series; Hadji is brought to life through Fallapisheh’s movements. The touch of the artist is likewise transposed onto the paper, which is connected to the viewers touch via the beads. 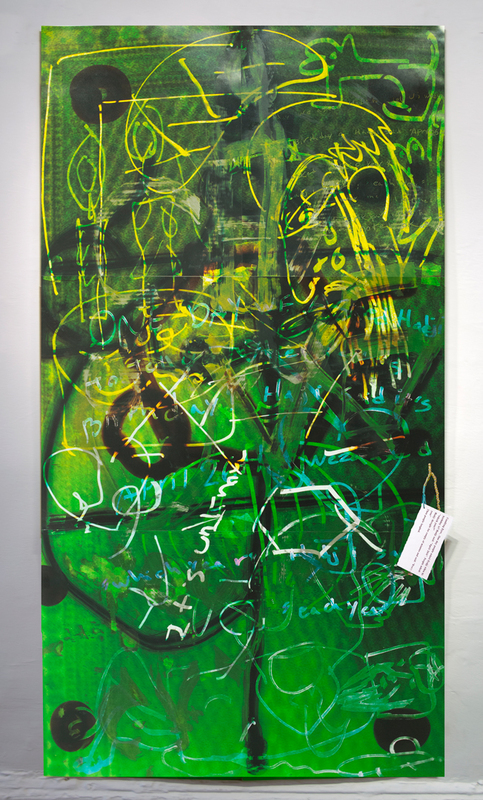 Fallapisheh was particularly happy with the placement of his work in a recent group show at Callicoon Fine Arts, as two photograms hung above the trap doors to the basement of the gallery. The doors reminded him of a grave, which seemed extremely fitting, as the Hadji character exists, at least for Fallahpisheh, as a sort of homunculus or zombie, animated through the projection of the artist’s memory on one side, and the projection of the viewer’s preconceptions on the other. Given a voice through the jokes and a slight corporeal heft through the beads, Hadji is figure that may be considered at length or quickly othered; precisely which is a choice that is left to the viewer. Images courtesy of Kai Matsumiya gallery. American west coast contemporary photographers in the vein of Eileen Quinlan?!! !